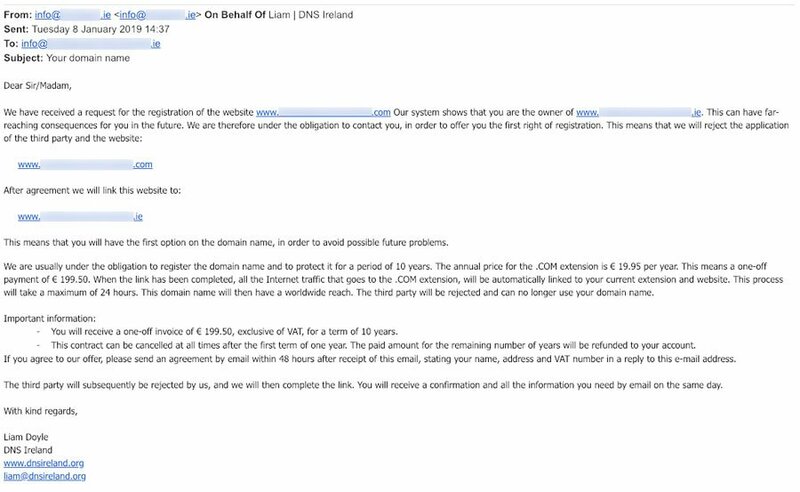 We were recently contacted by a client of ours who had received correspondence from a company called “DNS Ireland” informing them that someone was trying to register the .com versions of their .ie domains. They claim that they have “received a request for the registration” of the .com / .eu /.info versions of your domain and that they will offer you “first right of registration” as the registered owner of another version of that domain (Here in Ireland it is usually the .ie). They claim that they will register this domain for you for a period of 10 years to “protect it” for you and redirect it to your current domain. What nice guys eh! Wrong… The actual reality is that they will register your domain so they now own that domain – not you. Unfortunately for our client, they replied indicating their interest before contacting us to check on this. Their domains were purchased and they were eventually sent an invoice for hundreds of euros. If you are in this situation – DO NOT PAY, do not engage with them any further. Your .com / .eu / .info domain now belongs to them. If you do pay – you will not have ownership of that domain, they will. Even if you did somehow manage to talk them into transferring the domain to your registrar – you would need to pay for that domain all over again with your new registrar. It is also highly possible that they only register the domains for one year but are charging for 10 years in advance. I am afraid that there is no good news if they have registered your domains – they are gone. This is a pain many people experience from “Domain Squatters”. You did not need it before their scam email and you don’t need it now – especially in the case of .eu / .info domains. The .com can be a little harder to swallow but that is one of the downsides of open domain registration. If you currently have a .ie domain and the .com is available – make sure you register it now under your trusted domain registrar (eg: Blacknight, LetsHost, Namecheap etc… ). Then redirect that domain to your current domain or ask your web developer to do it for you. Don’t worry about other TLD’s (.net, .org, .eu, .info etc… ) unless there is a specific reason for needing them – they are not important. Do not engage with any of the emails. If possible, register your .com domain with your trusted registrar straight away – it is approx. €10 for a .com domain per year. If you have engaged – DO NOT PAY, cease all engagement with the emails. If you have paid, do not put yourself in a position of being dependant on that domain – for example, do not build your website on the .com or use it in any of your marketing materials because you do not have control over it. If you do, they are in a much better position and could choose to extort you further in the future. This kind of scam is incredibly frustrating and looks so convincing. They have a legitimate looking website apparently “founded in 2009 in the heart of Dublin”, but their website domain was only registered in August 2018 and their directors are based in the Netherlands. (See Peter Armstrong’s post on Spiral Hosting’s blog for more on this. ). Whenever you get an email offering services online – check with your trusted website developer first and/or Google the company with the words scam after it – Google is your friend here. I have not heard the experiences of anyone who has gone through with the arrangement but if you have – please do contact us to let us know and we will update this post with any new information that could help others. Make sure you share this information with all Irish business owners you know. The most effective way to stop it is with knowledge. There will always be another opportunist around the corner but every time we learn, we get a little wiser and more cautious about internet safety.